The tallest Ferris wheel in Moscow in the Park "Wheel in VVC". Attraction is the highest not only in the capital but throughout Russia and Eastern Europe. Located near the metro station "VDNKH", prospect Mira, VL. 119. Ferris wheel "Moscow 850" installed in 1997 and was accustomed to the 850 anniversary of Moscow. The height of the attraction is 73 meters, the turnover rate is seven minutes. The building has 35 indoor and outdoor 5 top lock of the booths. Both types have 8 seats. Wheel built with the expectation of Gale-force gusts that can reach up to 40 m/s and earthquake up to 9 points. In the closed cabins are allowed. Children under 16 must be accompanied by an adult. 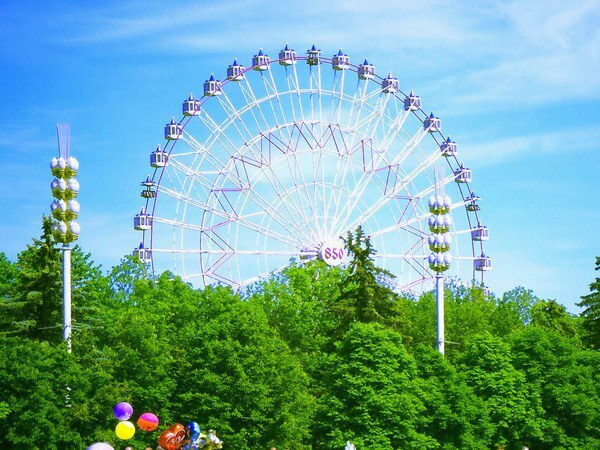 Ticket cost — 300 p. But from open cubicles the beauty of Moscow can enjoy people who have a height not lower than 140 cm Price: 350 p. In the Park there is a special offer for newlyweds: wedding day they can ride on the Ferris wheel absolutely for free. The ride is fully consistent with the standards of GOST 53130. This is confirmed by the expert organization JSC "Promservis", which has been accredited by Rosstandart of the Russian Federation. In September 2013 off the drive of the attraction rotating wheel. The people in the booths, landed smoothly on the ground. The next day the mechanics had replaced the pushrod and made the act. The attraction re-earned. Print publications reported extensively on this situation. The Ferris wheel is inside of the all-Russian Exhibition Centre. To get into the Park through the main gate of VVC. There are also entrances from the side of the pavilion №75 and exit "North-1". For reference apply phone 8 905 515 78 18 8 (495) 780 08 01. Attraction summer and spring open daily from 11:00 to 22:00 in winter and autumn, from 12:00 to 19:00. In the amusement Park there are 16 rides. The fearless can take a ride on the Cobra. This tower and the mountain with a dead loop. The locomotive rises to a height of 46 meters and falls down with a speed of 100 km/h, by way of breaking the dead loop. On a huge swing, "Mars" you can feel in weightlessness. The ride makes a complete revolution. For couples with children there is a "Formula of Peace". Here the movement of the engine more smooth. For younger kids will enjoy the trampoline "Dragon" carousel "Mary's Gourmet", the bumper lucky, games mazes and playgrounds, arcade complexes. In 2004, planned to build Ferris wheel "Rus-3000" height of 170 m, but the project was cancelled. Also consider installation of a 180-metre attraction in the Park of Culture in 2009. The world's biggest Ferris wheel is the Singapore Flyer in Singapore, his height is 165 m.